Patrick Eaves isn't known for smack talk - and at Smashfest VI, he let his paddle do the talking for a third straight title to complete a ping-pong hat trick. 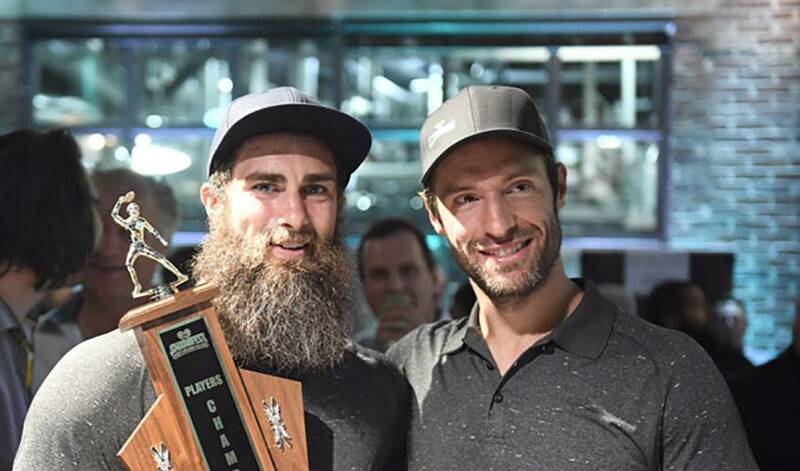 “Eaves is not the kind of guy to talk smack – there’s a lot of talking smack about Skinner being one of the sandbagger guys,” Smashfest host and founder Dominic Moore told media as over 600 people filled Steam Whistle Brewing Thursday for the sixth annual Smashfest Charity Ping-Pong Challenge. Created by Moore and supported by the NHLPA, Smashfest continues to grow its efforts to help support awareness and research into concussions and rare cancers. With Smashfest VI, one of the most unique charitable experiences has now raised over $665,000 to date, which could not have been done without the participation and support of the players, guests and partners alike. The added bonus? The connections forged among fellow NHL players and their fans. “This is a passion. This event, the fact that it’s six years already is crazy to me – we love putting it on, the atmosphere of it, we love the message of it. Obviously the causes are important to us but it’s just fun,” said Moore of his brainchild. More than $165,000 was raised from the 2017 edition of Smashfest through ticket sales, sponsor support, individual contributions along with exclusive live and silent auctions. ​This year marked the beginning of a new and exciting project for Smashfest – supporting The Broad Institute of Harvard and MIT, a research laboratory that plays a key role in revolutionizing the study and treatment of rare cancers. Dr. Jesse Boehm, Associate Director, Broad Cancer Program, flew in from Boston for the event. “In the space of rare cancers, it’s been very difficult to make a lot of progress because a research hospital might only see one patient with a given rare cancer type each year. We wondered whether it might be possible to use online platforms to partner directly with patients, enabling them to donate samples that could be grown in the laboratory and shared with researchers everywhere,” said Dr. Boehm. "When Dom reached out to us and indicated he wanted to pursue rare cancer research," continued Dr. Boehm, "we were able to explore the feasibility of this new idea. It’s going extremely well so far and we’re very excited about this new collaboration." Over 25 current and former players were on hand to take part in in the Pro-Am and individual competitions - and if there was ever a doubt that hockey players are a competitive breed, reigning two-time champ Patrick Eaves set the tone earlier this week by throwing down the gauntlet with this sensational video paired to the perfect iconic tune. Among the class of Smashfest VI first-timers were at least a few who were game to challenge Eaves for his throne leading up to the event. Alex Burrows returned for another year, looking for a different outcome against Eaves after narrowly missing out on the title last year by losing three sets to two after failing to convert on a match point in 2016. As fate would have it - Eaves and Burrows found their way into another Smashfest final. The outcome was all too similar for Burrows as Eaves pulled off the three-peat with a hat trick of Smashfest wins. Jeff Skinner also took home bragging rights as the Pro-Am tournament champion- and if you were following along the story lines, he put the rumours of his ping-pong lessons to bed as false. Among current players that joined host Dominic Moore were Taylor Hall, Matthew Tkachuk, Jeff Skinner, Patrick Eaves, Alex Burrows, Derick Brassard, Connor Brown, Zach Hyman, Connor Carrick, Boone Jenner, Connor Carrick, Ryan Spooner, Antoine Roussel, Chris Tierney, Josh Anderson, Andreas Athanasiou, Sam Bennett, Joe Blandisi, Michael Latta, Brandon Montour, Devin Shore, Scott Harrington, and Joseph Cramarossa. Former players Craig Adams, Steve Moore and Mike Johnson also were in attendance Thursday evening. Other notable members of the sporting community were on hand for the 2017 event, including Hockey Night in Canada host Ron MacLean, Sportsnet President Scott Moore, and hockey reporter Elliotte Friedman who also authors the highly respected 30 Thoughts column. Sportsnet’s Caroline Cameron was also on hand for Facebook Live interviews, getting real-time reactions and updates from the players as the tournament carried on. As each year's event grows bigger and better, so does Dominic Moore's commitment to making the most impact possible with the event's proceeds. "He's (Moore) come into the lab, he’s put on his gloves, we’ve given him a lab coat and shown him these pieces of cancer cells that are growing in the lab," continued Dr. Boehm. "He really wants to get in there and look under the microscope." For more on the Broad Institute and the amazing Cancer Cell Line Factory, see the below video. For more of the action from Thursday’s event, check out the hashtag #SmashfestVI across social media.